Wombat Day IX is tomorrow, October 22, 2013! The gang couldn’t wait, and got a bit of a head-start. Don’t forget to celebrate with a wombat cake, wombat brownies, wombat fudge, and wine gums. And for those of you who can’t get wine gums, Swedish Fish are the next best thing. Andro has been a very busy Wombie, making numerous pre-Wombat Day posts and fan art announcing our great day. They include Wombat Day Soon and Wombies Love Chocolate, both posted on October 20, and Don’t Forget Wombat Day Tomorrow and Wombat Day Greeting posted on October 21. Andro’s done more Wombat Day posts than we have! Faythe from GrammyMouseTails posted an early Wombat Day! Time to party! post on her blog to mark the occasion. Debbie Adams, from Adamsart, made a Happy Wombat Day 2013 piece of fan art featuring her adopted Wombie Shadow and his chocolate fish-shaped cakes. Dave from 8-Bit Nerds posted a picture of Fraz wearing a wombat mask for Wombat Day on his October 22, 2013 post on his blog. Sandee from Comedy Plus Blogspot posted a Happy Wombat Day! post on her blog for the special day. 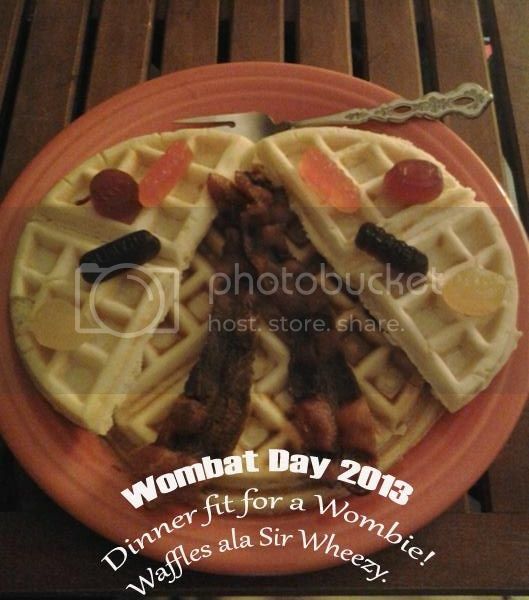 Andro, from his Gray Dawster blog, posted a Happy Wombat Day 2013 post with some fan art he created. Cha, from Dontchawannadream, painted a Wombat Day picture of the gang as Wombie gangsta rappers for her Happy Wombat Day 2013!! post. Novroz from Underneath The Shell posted a Wombat Day announcement on her Kroten on The Park post. Rachael from YoYo-Dyne Propulsion Systems put up a Happy Wombat Day 2013! post on her blog to help celebrate the holiday. Some of us may be starting our Wombat Day celebrations a bit early this year! Like today! Happy Wombat Day to you too, Andro! I hope you picked up the mini wombat cake with your name on it by the door! There’s one for everyone! And don’t forget the other goodies, too! I don’t think you will! I am! But I’m a little tired after serving everyone chocolate all day long! I started early too! One can never have enough chocolate and wine gums. Pass those milk shakes around here too. I don’t blame you! Who could resist all those wombat goodies! Make sure you get your mini wombat cake with your milkshake! There’ll be more treats for tomorrow! Don’t worry! Claudius is making a Wombat Day cake? I didn’t know Claudius could bake! Well they should send in some pictures of their Wombat Day cakes that they make so we can put them up on our cake page! You should lie down with a nice thick milkshake and some wine gums! You need to have enough energy for the all day Wombie party tomorrow! I know! I can hardly believe Wombat Day is finally here!! Ahem, you also beat me to first. Andro wanted to make sure he got to the goodies first! And there’s another truckload of sweets coming, so no one will go without! Goodie trucks are coming all day long! I hope nobody goes driving after drinking too much wine… gums. Oh never mind, it was written by AMY MIDDLETON. I’m not yelling, I just copy/pasted her name. Yes, I don’t think that’s me! I did know about it, but I didn’t write it. They didn’t even give us recognition! After celebrating, everyone’s tummies will be too full to get behind the wheel, so you don’t have to worry. Thanks! I hope they do! Happy Wombat Day! Happy early Wombat day indeed. I’ve got my post ready to go. Happy early Wombat Day to you, too. Happy Wombat Day…I’ve got the cake and ice cream ready! Yay! We’ll be right over! Binky, Winky, Fraz and Peter Hi! Just getting ready for the big celebration tomorrow. Victor and Victoria are beside themselves. Which is kind of weird is you consider the physics involved. Have WINE GUMS left just for Wombat Day 2013. Waffle Iron has NOT been packed so mom or my friend Wayne both promised to make waffles available for all party goers. We’ve been scarce around here because of the big move to California in 2 weeks and serious work on physical therapy. Hey, we have to work off these treats some how! Happy Wombat Day to all! Nice to hear from you, Rachael! All the Wombies around here have a tough time waiting for the big day, too. So tough in fact that they’ve decided to start partying today with a pre-Wombat Day Wombat Day celebration. I’m glad you have some wine gums left! It just wouldn’t be wombat day without them. I hope your PT is going well and that you’re progressing. And good luck on the move. Moving under normal circumstances is not much fun, so your long distance must be quite an ordeal. Down to one day. woot! And we can hardly wait! Actually we’re not waiting! We started our party today! Yay! It’s Wombat Day being celebrated a day early! That one more day of goodies and fun! I’ll leave all of you with some chocolate milkshakes for now, for tomorrow there will be so much more! We figured we needed a pre-Wombat Day Wombat Day party! That means twice as much chocolate and wine gums for everyone! I can’t wait for tomorrow for your surprises! I brought you a big Winky size stack of chocolate chip pancakes with lots of syrup and butter. 3 gallons of chocolate milk and 3 dozen of chocolate doughnuts to get you start out this morning! Oh, the chocolate doughnut are oozing with chocolate filling too! Oh boy! Thanks, Deb! I need an extra big breakfast for today! I don’t want to run out of energy. There’s too much to do today! I brought you a choco-sub filled with layers of all your favorite chocolates! Chocolate chips…super crisp and of course A Winky’s sized Jumbo shake. The best part is, there choco-subs for everyone! And just in time! I was getting kind of woozy. It’s tough handing out chocolates all day long! Well, okay, not that tough. But I’m still super hungry! Deb always knows just what we want! You won’t leave hungry, that’s for sure! Any excuse for cake and I am sure the Wombies are for it! Cake is hard to beat! And we Wombies don’t need an excuse to have it! Now I really want some of that Wombie cake! I saw all the different kinds of Wombie cakes in your other post and I must say they look delicious! Wombie cakes from around the world! I don’t think you can make a bad Wombie cake! Whoo Hoo! time to party and stuff our tummies! I made a special treat this year. Come and grab some before I eat it all. Oh boy, more treats! You can never have too many treats on Wombat Day! Happy Wombat Day to you too, Faythe! You can never have to many treat especially chocolate on any day! Party Time. From me and the Bears Happy day. Enjoy the chocolate. Thanks, JB! I hope you all have a good chocolate-filled Wombat Day, too! Gimme a “W”! Gimme an “O”! Gimme an “M”! Gimme a “B”! Gimme an “A”! Gimme a “T”! Wombat Day! Yeahh!!! I’ll give you some chocolate, wine gums, pancakes, and milkshakes! Hey! Happy Wombat Day ..wombies and humans alike..lol. Yay to chocolate, chocolate cake and that awesome combination ice cream which had raspberry and erm…some other awesome stuff in it!! Oh that thingy called wine gums?? Happy Wombat Day, Shree! Make sure you get enough chocolate today! It’s a must! And if you can’t get wine gums where you are, maybe you can get Swedish Fish with are similar (but not quite as good!). Happy Wombat Day, Lauren! That license plate frame sounds like us. Wombies live on chocolate and wine gums! They don’t have any wine in them, though. They’re like Swedish Fish, but better. Of course we’ll save some chocolate for you! We have enough treats for everyone! Happy Wombat Day Everyone!. It’s the best day of the year! Mom sent me over with a batch of cookies big enough to feed an army! Happy Wombat Day, Dink! Those cookies look good. And I think we will have fed an army by the time the day’s over! Does anyone have any doughnuts? I’m starved! Happy Wombat Day, Chewy! The doughnuts are between the eclairs and the chocolate chip muffins! Dad found a great spot for me to fish! So I brought Chocofish! There so good!! That’s good, Shadow. We don’t get Chocofish around here, so it’ll be a real treat! I got up really early this morning to help mom make enough chocolate milkshakes to last the whole day for everyone! I got some recipes from Fraz, so there a big variety of them! Drink up, and be careful not to get a brain freeze! We needed more milkshakes, too! Fraz is too busy eating to make any. We wouldn’t want our guests to go without a milkshake! Can you get your wagon out and pull this barrel of milkshake here mom and I made, Winky!…It’s super thick and chocolatey! Sure! I might steal a taste of it though. Just to make sure it’s good! I like Winky’s big belly! What Tink? Oh…Happy Wombat Day Everyone! Happy Wombat Day, Cookie! I work hard on my belly! It keeps me happy! It looks like it would jiggles when you walk. You must be proud! It also jiggles when I giggle! I’ve trained it well! I brought chocolate cover seeds for everyone. And here a peck on the check for Binky!…for Wombat Day silly! Now that you’re here, my day is complete! There’s no other place I’d rather be today! And no other owl I’d rather be with. Fraz, when we going pirating again. I’ve been out of the water too long. We should go out pirating this weekend! Before it gets too cold. Finally we’ll go back out to sea! Arrg! Can I have a chocofish…I’m hungry! We should be able to get in at least one more pirating adventure before winter! The chocofish are over there in the milkshake aquarium! Happy Wombat Day, Sabina! That’s a wish the Wombies will really appreciate! We hope the same for you, too. Thanks, Rosey! Happy Wombat Day to you, too! Make sure you grab some chocolate! Happy Wombat Day!! This afternoon, I made a special painting for you, my dear friends!! Been very tired lately so I had to work pretty quickly today to post it before midnight! 🙂 And I did it! Yayyyy!! Xxxx 😀 😀 Let’s party now! And by the way Coco and Vanille are super excited. It’s like Christmas for them!! It’s awfully hard for Wombies to contain themselves on Wombat Day. Even shy ones! BONJOUR Coco and Vanille! I hope you guys got your fill of Belgian chocolates! My turtles and I were planning to do something for this special day…but I got too busy, sorry. That’s okay, Novoz. We appreciate the announcement you put up on your blog. Happy Wombat Day! Happy Wombat Day, Novroz! And to Kroten and Kurome and Papoe too, of course! Thanks, Indrani. Happy Wombat Day! Thanks, Nef. Mostly Wombat Day is an excuse to eat chocolate and wine gums. Wombie Day Feast at Rachael’s! I couldn’t get the picture to display either at first. I went to your Photobucket page and got the HTML code, and that worked. The IMG code doesn’t work here apparently. I give up. Too early lol. Sugar hangover ouch. Will post at YoYo-Dyne. Hope you all had a fine day! We humans can’t compete with the Wombies when it comes to sugar! Hope you had a good Wombat Day, too, Rachael. Waffles and wine gums are a good start to any day! Oh… I missed it this year. Kinda on a flat spot with my comics at the moment. You’ve got so many characters, maybe you should let them take over your comic for a while. Not as if they haven’t done that before! Peter, this strip is beautifully colored! Thanks, Denny. It was supposed to be happy and festive for their Wombat Day party.